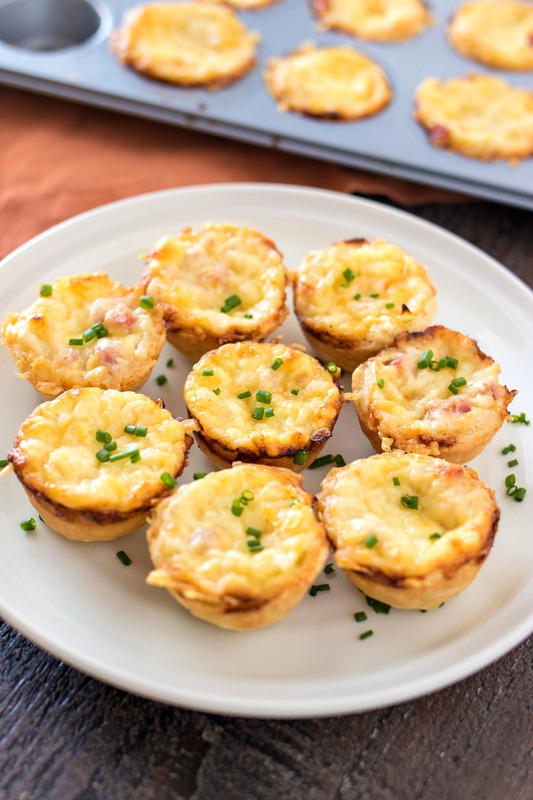 Mini Ham and Cheese Quiche with Caramelized Onions – A mini, buttery pastry crust filled with a mixture of eggs, cream, diced ham, gruyere cheese, and caramelized onions. These small little quiche are perfect for serving at parties and brunches. Oh man…Easter is almost here, guys! I am so ready to dig into some rich, creamy chocolate. I have a huge chocolate peanut butter egg waiting for me to eat the second I wake on Easter morning. And then I’ll probably be making my favorite chocolate cake on the planet for breakfast. Yay! If you’re new to the blog, I gave up chocolate for lent. It’s been strugglesville for the last 40 days and, man, am I ready it to be over. Clearly. Today’s recipe is also a great one to serve on Easter: mini ham and cheese quiche with caramelized onions. It’s an adaptation of the first-ever quiche I made, which happen to be on Easter. I had a go-big-or-go-home attitude that year so I just had to make this deep-dish quiche from Tyler Florence. He made it look easy enough so why not? Well, I failed to realize how long this baby took to bake in the oven. Sure, the recipe says it cooks for 1 hour and 45 minutes but scroll to the bottom and it says you also need to let it cool for 30 minutes so it can set. Otherwise, you’ll have a gloopy mess when you try to cut it. My family was not pleased about eating late, I’ll just say that. But there was no denying the rich, creamy, buttery flavors of this quiche so I didn’t want to eliminate it from my repertoire completely just because it’s annoying to bake. Therefore, I opted of making this quiche into mini bites instead of a huge deep-dish. It cut out 1 1/2 hours of time! Man, did they turn out beautifully, or what?! As I mentioned above, this quiche is super rich and creamy and buttery. But worth every bite! I could only handle a few before needing a break but my husband was eating them all night long. This recipe was definitely one of his favorites. The best part about the quiche, in my opinion, is the crust. It is so crispy and buttery, as it should be, but it is also perfectly salty so the flavor just explodes all over your taste buds. I had some leftover crust that I just threw out because I didn’t know what to do with it. After tasting it with the quiche, I immediately regretted my decision; I should have just baked it by itself with a sprinkle of Parmesan for snacking. Learn from my mistakes! I kept all the elements of Tyler’s recipe – crust, diced ham, caramelized onions, egg mixture- but I added one more that just had to be done: Gruyere cheese. Have you had it before? It’s super nutty and salty. And it’s the cheese most commonly found on top of french onion soup (and also in these sliders!). There wasn’t a whole lot of real estate left in the quiche shells after adding the ham and onions so I decided to add the cheese on top instead on inside the quiche. I love the crispy edges formed by the cheese! It gives the fancy quiche a little rustic flare. One thing that I wish I did differently was dice the onions instead of slicing them. When sliced, the onions take up too much room so I couldn’t get as much egg mixture in the shell as I would have liked. So that’s why I tell you to dice the onions in the recipe, even though they clearly looked sliced below. I don’t have to tell you how perfect these quiche are for your next party or brunch. Who can turn down eggs, cheese, ham, and pastry?! And they’re in small size so no utensils needed! That’s a major plus when hosting a larger party. You don’t want to see people struggling for a seat so they can eat their food with a knife and fork. It’s very important to chill the dough before you roll it out. Warm pastry dough does not get flaky, but rather it’s kind of doughy and greasy. No bueno. It only takes 20 minutes so it’ll go by fast while you work on the filling. If you don’t have Gruyere or you don’t want to spend the $$$ on it, you can substitute Parmesan cheese. I would still buy it and shred it yourself, if you can. That way it will melt better. To prevent the egg mixture from going all over the place, I recommend using a spouted bowl or measuring cup to pour the mixture into each muffin mold. I used my measuring cup since it has a handle. It worked like a charm! I highly encourage you to use a 24-cup mini muffin tin. I used to have one with only 12 cups and I’d have to do everything in two batches because most recipes makes 24. If you’re in the market for one, this is the one I use and it’s amazing because it’s super non-stick. Even though the cheese melted all over the place, it wiped right off. I hope you’re drooling after reading this post. If so, I’ve done my job. I also hope you make these for your Easter celebration or even for Mother’s Day next month! Once you do, let me know how they turned out by commenting below! A mini, buttery pastry crust filled with a mixture of eggs, cream, diced ham, gruyere cheese, and caramelized onions. These small little quiche are perfect for serving at parties and brunches. First, we'll make the crust. Add the flour, salt, and sugar in a medium bowl. Cut the butter into small cubes and add to the flour mixture. Use your hands (or a pastry blender) to combine the two until the butter is the size of small crumbs. Mix egg yolk and water together in a small bowl. Make a well in the flour and butter mixture and add the egg yolk mixture to the well. Use a fork to gently combine the mixture together. Once combined, use your hands to form mixture into a disk. If the mixture is too crumbly to come together, add a little more water. Wrap disk in plastic wrap and freeze for 20 minutes. In the meantime, start the filling. Add 1 1/2 tablespoons olive oil and onions to a medium skillet. Turn heat to medium and begin to cook onions until they are translucent, about 10 minutes. Add diced ham and continue to cook for another 10 minutes. Stir occasionally. Remove from heat and set aside. Preheat oven to 375 degrees. After crust has chilled in the freezer for 20 minutes, place on floured surface and begin rolling into a large circle, about 1/8 inch thick. Using a 2.75-inch round cutter, cut out 24 circles. Keep in mind, you will probably need to roll out the scraps from the first batch in order to get 24 rounds. Grease a mini-muffin tin with non-stick spray. Place each circle over a mini muffin mold and press it completely in the mold using your fingers or a shot glass. Push crust up the edges of the mold. My muffin tin has 24 molds so I could fit them all into one pan. But if your mold only holds 12, you'll have to do two batches. Place tin back in the freezer while we prepare the rest of the filling. Whisk eggs until they become frothy. Add cream, salt, and pepper and whisk together. Pull the muffin tin from the freezer. Grab the ham and onion mixture and place a little in the bottom of each muffin mold. Be careful not to overfill or you won't be able to add any of the egg mixture. Fill each muffin mold to the top with the egg mixture. I find it much easier to do this with a bowl or measuring cup that has a spout. Once all molds are filled, top each one with 1/2 teaspoon of shredded gruyere cheese. Place quiche into prepared oven and bake for about 20 minutes. The quiche will get really puffy and the cheese edges will get crispy. Remove from oven and let them cool in the pan for 10 minutes. Remove from pan and place on plate to cool for another few minutes before eating. Serve warm or at room temperature. you had me at cheese! these look amazing! I love anything bite sized! Making these this Sunday for our week breakfasts on the go, looks so delicious, cannot wait to see how they come out. Yay! Such a great way to enjoy these quiche. Let me know how you like them! These are so cute and convenient for on the go. I love quiche so I can’t wait to make this recipe! eating a whole tray of them by myself for dinner! Man those look good – perfect to bring to a brunch! I love quiche! I think I’ll try this recipe with turkey. They look really good – I’m almost sorry that I already had my breakfast…. I love quiches because 1. They are delicious, and 2. They can multitask as a breakfast, lunch, or dinner – and since these are mini they could be a snack too! You’re so right – perfect for so many kinds of events and meals! This looks AMAZING! Definitely adding this to my weekend breakfast recipes! These are too cute. They look delicious and would be perfect for portion control. My husband and son go crazy over ham and cheese, so these would be super popular at my house. Thanks so much! That’s a huge reason why I love bite-sized food – portion control! These are so adorable and sound absolutely delicious. If I ever have a tea party I would love to make these! Haha perfect! Glad you love it! You’ll be surprised at how easy it is! Oh my goodness. What a perfect breakfast! Yum!